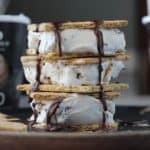 These easy ice cream sandwiches are a delicious summer dessert! In a small microwave-safe dish, melt the coconut oil until it is liquid. Stir in the cocoa powder until it’s a smooth consistency. If you like a sweeter chocolate sauce, stir in the honey. If you like super dark chocolate, skip it. Scoop ½ cup of mousse onto 4 graham crackers and then top with the second graham cracker. Use the back of a spoon to drizzle the sauce on top of each sandwich. The coconut oil will harden when it comes in contact with the sandwich. If not eating immediately, store in an airtight container in the freezer.